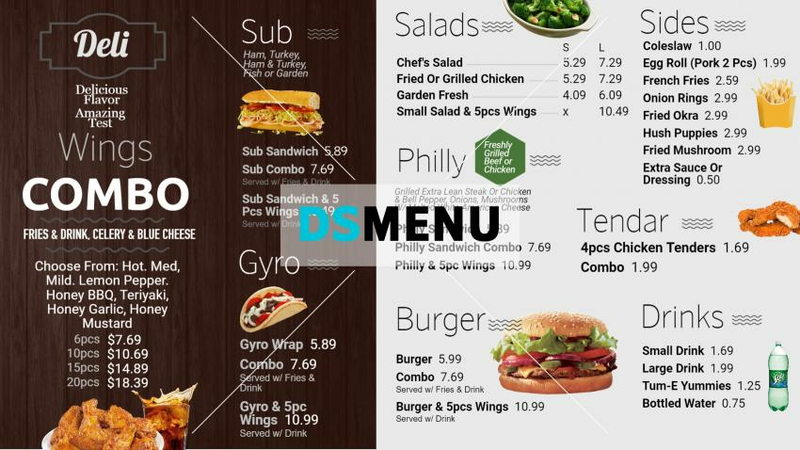 This exquisitely designed Deli menu board is truly elegance personified. The dark brown and white colors divide the menu board in half. The multi-color graphics and the black and white lettering too contribute to its polish. On a digital signage menu board the impact would certainly entice the target audience of all age and income groups. The succulent menu includes Chicken wings combo offfers , together with Subs, Gyros, Grills, Burgers, Sides , Tendars and Drinks. Truly a bevy of cuisine delights !